Collecting the breakout hit series’ debut miniseries, and setting the stage for more! *Squarriors* is a comic book serial that centers around several clans of animals living in a world recently voided of humans. Since the demise of humanity, the remaining animal life have become intelligent. The spark of rational thought creates an internal struggle for these creatures; instinct versus reason. And the clashing of these ideas erupts into ultra-violent wars across the planet! Squarriors is not a story for the meek. Yes, it may feature squirrels, foxes and cats, but this is a story of war. Think “Game Of Thrones” crossed with “Watership Down”. We get thrown right into the action too – with a death on the very first pages – just look at the preview up above. What follows is an amazing read of the trials and tribulations of a tribe of mainly squirrels. And underlying all that, is the question – what happened to the humans? From writer Ash Maczko – behind the Count-I-Con in Grayslake, Illinois – we get an excellently crafted story which gives us a harrowing introduction of the world the animals now live in. We see the trials before them, the dangers, and also the sense of family. The Tin Kin make a family like the Starks -they have a sense of honour, but there are things going on in the background too. Talks of battles with the Maw (another clan) betrayals, and kidnapped children. The Tin Kin are not in a good position, and you get the feeling that things are going to get worse for them before they get better. Dotted in between this story are flashbacks to the time that humans ran the world. It concentrates on a family, a wife, a husband (in the army) and their son. There are mutterings of problems, power outages and attacks, but we still have no concrete story, which adds to the mystery of the humans. Although this volume acts as a large introduction, it is still an amazing read which builds up the world that we are now in. As for the art – wow! Ashley Witter has work for Marvel, DC, Titan and Dynamite. And this art here is an excellent showcase of her work. From the battle and attack scenes, full of action and suspense, to the slower paced scenes. We get no talking heads and we get a real sense of feeling from the characters. There are sideways expressions, emotions and more – all combined in busy scenes of the grass or in old towers. Still the images pop – check out the final page of the preview above, and you get an amazing feeling of action, suspense and horror in one panel! On top of all this, there’s going to be a Squarriors card game which is coming to Kickstarter soon – keep tuned as will be posting (and backing) this game! 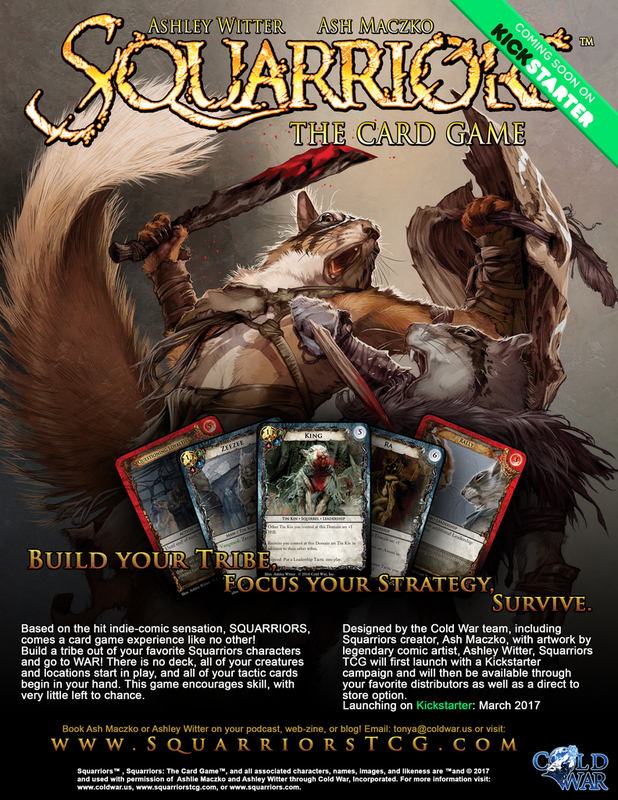 Each member of your tribe in Squarriors the Card Game is a valuable part of the whole. 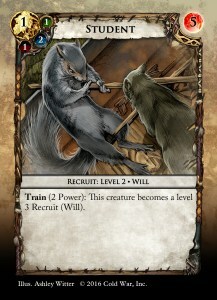 Unique, named, Creatures that begin the game in your tribe are some of your greatest assets but adding Recruits during gameplay can shift the winning balance. These random animals start small but can be trained into useful beasts which rival the starting crew. As they progress, certain specializations occur giving them advantages in specific situations and allowing any player to cover holes in their strategy by properly promoting Recruits.